Independent living is a feat that can become increasingly more difficult with age, injury, or medical complications. For this reason, technology is constantly improving in order to help every day people continue to live their lives fully and freely, without assistance from nurses or loved ones. The advent of the shower chair marks an advance in the field of health and medicine regarding independent living. Elderly or mobility-impaired individuals can benefit greatly from this simple invention, with a laborious, often-dangerous task like taking a shower becoming suddenly within reach. Because the shower seat is meant to keep you or your loved one safe from slipping and falling while taking a shower, a poorly constructed, or poorly designed seat can be incredibly dangerous. It is important to invest in a product that, while cost-effective, does the job right. This is especially true when it comes to products like these. Below are bath chairs we think are some of the most innovative, safe, well-designed shower chairs on the market right now so that you can make the most educated choice for your situation. 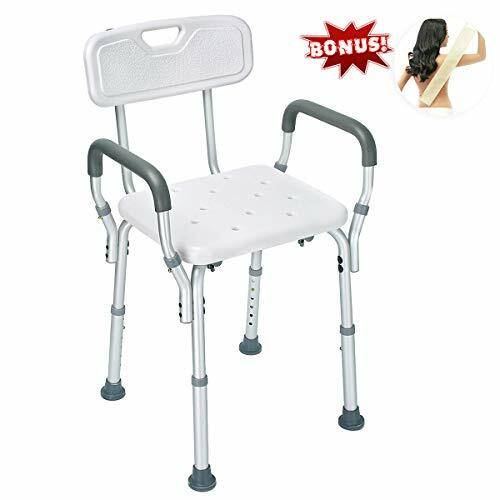 This shower chair for elderly users is a favorite among seniors as well as individuals with limited mobility or injury, who are looking for a good blend of hygiene, safety, and comfort. The padded armrest and removable backrest make this a versatile device that can serve a wide range of individuals with varying degrees of physical stressors. With a 300-pound weight capacity, this chair is able to provide shower support for various individuals of different sizes and heights. It’s anodized aluminum frame keeps it durable and secure in place as well as free from rust and discoloration over time. This is one of the most hygienic models on the market, with its anti-bacterial polyethylene seat. This feature makes it one of the highest rated chairs among users, who are able to use it over long periods of time without the need for replacement or repair. Its simple, tool-free assembly is another bonus of using this device. Hygienic – With its anti-bacterial seat, this chair is perfect for individuals who want to ensure that their bathroom space is clean and sanitized, and free of germs that may cause illness. Weight – Because of its durability, this seat is not the most lightweight option on the market. Those who want a lighter weight option and care less about durability may want to try another model or brand. Is This the Shower Chair for You? 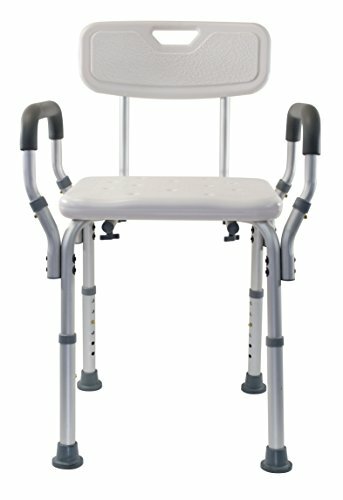 The Medical Tool-Free Assembly Spa Bathtub Shower Lift Chair is perfect for seniors or those with limited mobility or injury. It is great for long-term use as it is durable and free from rust as well as easy to clean. For a hygienic, durable chair, this is a great option. This chair doesn’t take any damage from constant water exposure. With its powerful aluminum anodized frame, it does not rust or discolor over time. This seat’s pristine appearance even after years of wear and tear makes it an industry favorite. This sturdy seat makes it easy to use in any space, with any individual, for any purpose, and this is because of how customizable it is. 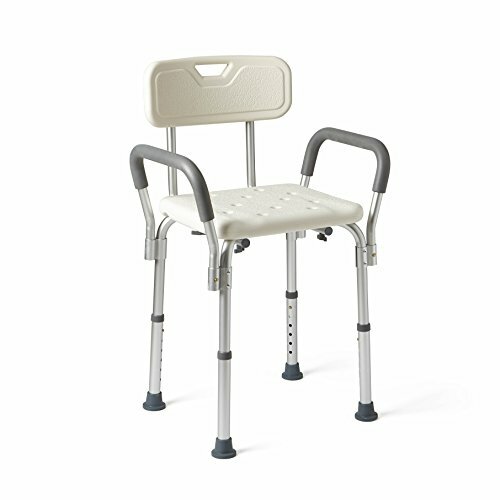 Other chairs may utilize a removable back, but this medical shower chair also makes use of two removable padded armrests. By making the armrests removable, this seat can quickly be converted into a stool or bench, which can make dismounting the device and exiting the shower or bath easier. Versatility – One of the biggest plusses of this chair is how much it can be customized. With removable padded arms as well as a removable back, this chair can quickly turn into a stool or a seat to become more lightweight or to fit into smaller spaces. Height options – This chair can unfortunately only extend or contract by four inches in height, as opposed to some other models that can extend taller. Someone who is recovering from an injury, and who counts on a seat that can develop and change with their progress and healing could benefit greatly from the Essential Medical Supply Shower Bench with Arms and Back. The customizable nature of the seat means that you won’t ever have to buy a new chair to suit your needs. This shower chair’s non-slip feet and a sturdy aluminum frame make it one of the safest models on the market, and a top choice among individuals who prioritize durability when it comes to purchasing the best shower chair for their needs. This impressive seat has a 350 lb. weight capacity, which is significantly higher than competitors. This means that it can support a wider range of individuals, and can stand up to wear and tear. One of its biggest benefits is how easily cleaned this product is. Weight Capacity – This seat can handle up to 350 lbs., which is significantly higher than the capacity of other bath chairs. Versatility – While this is a durable option for usage, it does not have many adjustable features other than height. When it comes to durability and weight capacity, the Medline Shower Chair Bath Seat with Padded Armrests and Back is one of the most widely anticipated models out there. Individuals trust this product to guarantee safety and security while showering or bathing. This lightweight seat is the ideal option for travelers, or for those who may need to move their chair in and out of the shower before and after use. It is incredibly lightweight (weighing only 4 lbs.) with the same durability and strength as competing models. In addition to being very affordable, with a cost that is significantly more efficiently priced than competing brands, this seat is adjustable, durable, and lightweight. It is able to adjust within a six-inch range by inch long increments. This means that users of varying heights can customize the product to their own specifications. In addition to adjustability, this product is also resistant to rusting or damage that can occur from exposure over time. This is due to its anodized aluminum construction. This clever design also means that it can be easily assembled without the use of tools. Lightweight and portable – As opposed to competitors, which weigh between 6 and 8 lbs., this seat is only about 4 lbs., making it the perfect size for travel and changing locations. 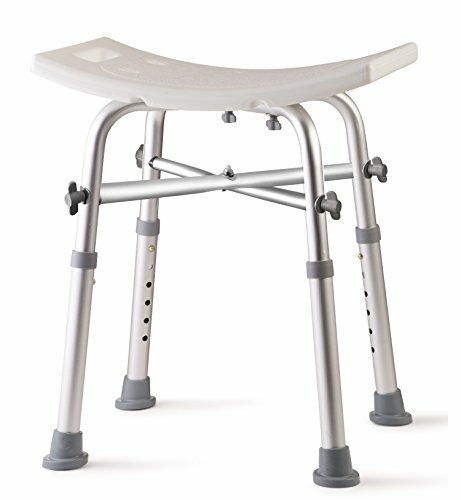 No back support – This stool would not be a good choice for anyone who knows they will require back support while showering or bathing, as it does not have an attachable back. For a lightweight, portable option, Dr. Kay’s Adjustable Height Bath and Shower Chair is the most economical option out there. With its low weight and its easy assembly, this shower seat is making waves in the industry without compromising on weight capacity or durability to enhance other features. OUR MAXIMUM HEIGHT IS A FULL 2-INCHES HIGHER: Some of our closest competitors make a similar product, but they skimp on the height - which could leave you struggling. Adjusts from 12.5" to 18.5". A selling point of this wildly popular item is its recyclable and degradable seat and backrest. Buyers with a mind toward environmentally friendly products will delight at this chair. Versatility is certainly one of the reasons that this shower seat has found such success. Its customizable features include removable back support and armrests, as well as the ability to adjust the height by five inches. These factors make it easy for individuals who may be in a healing process or physical therapy to adjust the seat to fit their capabilities at the time. Versatility – The back support and armrests can be removed, and the height can be adjusted, making this seat incredibly customizable. Price – Due to this product’s myriad benefits, including its various certifications and its 30-day money back guarantee, 60-day return policy, and 3-year limited warranty, it comes at a higher price than other chairs. 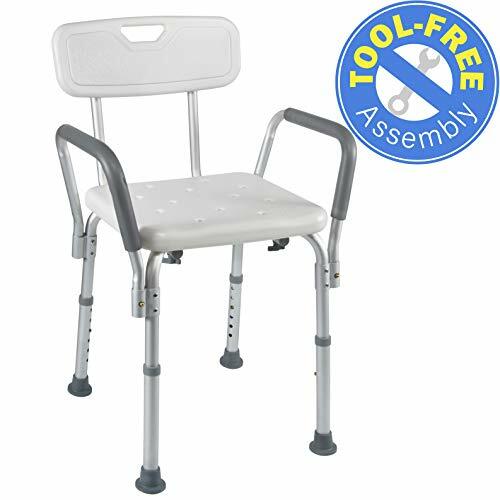 If safety regulations, environmental friendliness, or customizability are among your top priorities, then the Health Line Tool-Free Assembly Shower Chair could be a perfect match for your needs. FDA, CE CERTIFICATED SHOWER CHAIR w/BACK & HANDLE: Germany-imported, advanced machinery and production process ensures both comfort and safety. ONE MORE INNER GIFT BOX, 100% AUTHENTICITY GUARANTEE: great gift for Thanks Giving Day, Christmas for seniors, elderly, disabled, pregnant women... .